As the train was rushing in the direction of Gdansk, our persistent and motivated history campers used that time to finish the tasks from Prague and make sure you will be able to see and experience Prague’s street beat. 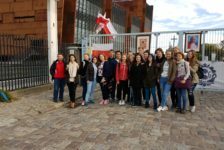 Just before noon they entered the lovely city of Gdansk – the final destination of the »backpacking Višegrad« History Camp. Since the afternoon agenda included a tour through the museum and preparation for the interviews, they first needed to fuel up with a delicious lunch at the hostel. 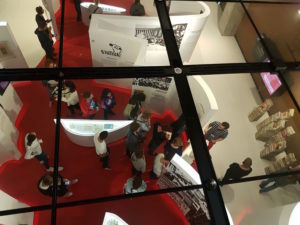 History campers visiting the European Solidarity Centre (Source: Eustory). 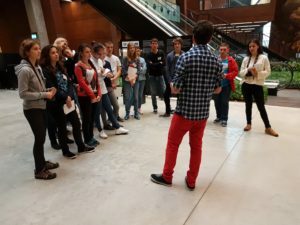 Fully energized, our participants started discovering the streets of Gdansk, while making their way to the European Solidarity Centre (Europejskie centrum solidarnosci – ECS). There they were warmly welcomed by Anna Zielinska, the head of the education department, and taken on a guided tour through the museum. Thus, they followed the chronological developments of the events that established the Solidarnosc movement and led to introduction of the martial law. Impressed by the exhibits and the art of presenting the events connected with the Solidarnosc movement, the history campers returned to the hostel. 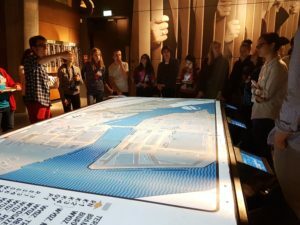 Looking at one of many interesting original exhibits: the map of the Gdansk shipyard (Source: Eustory). Admiring ECS’s approach to presenting the Solidarity movement (Source: Eustory). 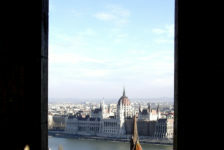 The tour through the museum offered diverse perspectives (Source: Eustory). 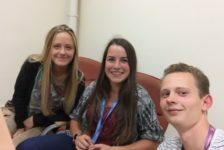 Since the day was far from being over, Tina and Clemens (our project manager and the consulting journalist) presented them with a task for the next day. 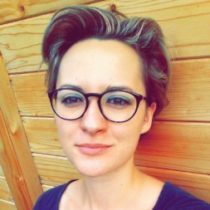 Namely, Thursday will revolve mostly around the interviews of Russian and Polish journalists, an editor and a political analyst – a promising fact for acquiring interesting information about media freedom, political propaganda and journalistic ethics. 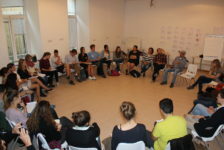 Reporting on the information gathered on the streets of Gdansk (Source: Eustory). 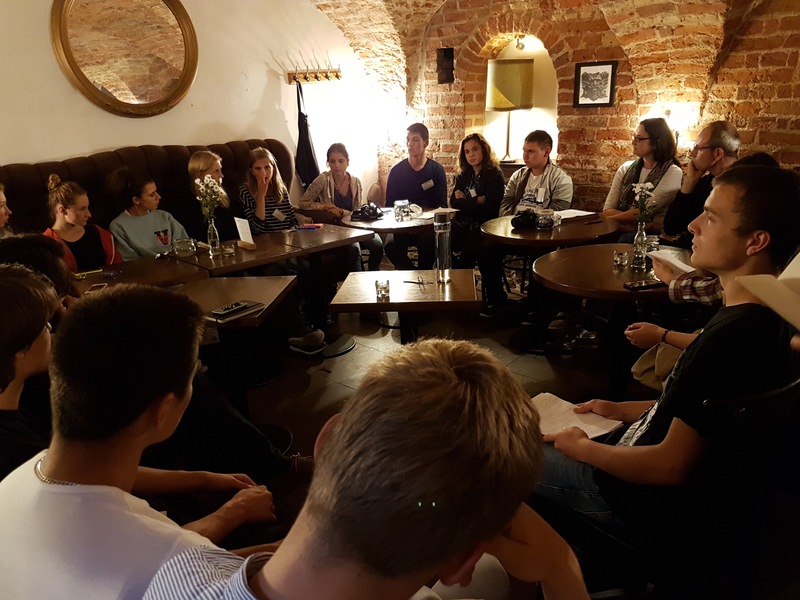 However, before preparing the questions for the interviewees, our history enthusiasts first needed to get acquainted with the current socio-political situation in Poland. 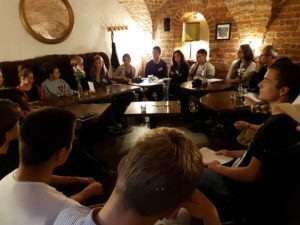 In order to do that, we have sent them through the time-machine: instead of internet they had to use a pen, paper, their journalistic approach and curiousity and hit the streets of Gdansk, where they interviewed people on the current situation in Poland. 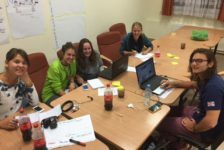 As usually, they came back with interesting information and experiences and started working on the questions for tomorrow’s interviewees. 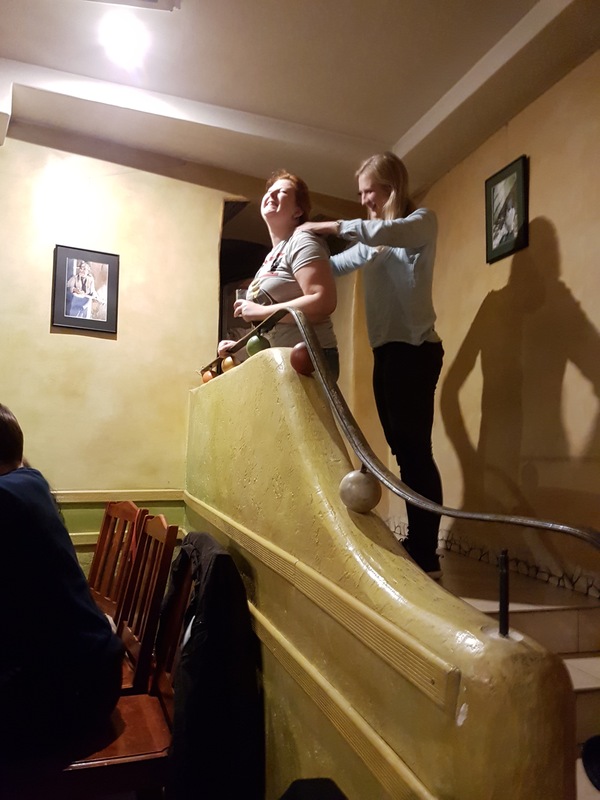 The first day in Gdansk ended with a green dragon, who took care of the dinner for our participants and the organizing team. 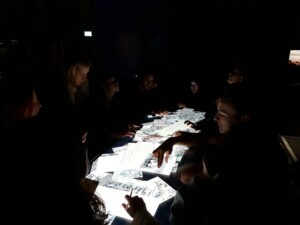 The latter was this evening enriched by the company of Katja Fausser and Sven Tetzlaff from the Körber Foundation. Joined by the newcomers we ended our first night in Gdansk as all the other nights before – be it either in Budapest, Prague or somewhere in between – with a live stream. After a long day, our participants deserved and provided relaxing massages (Source: Eustory).